Thanks so much everyone for your lovely comments on my new Poncho pattern. I'm so excited to see that some of you have already made a start and it's great to see the fabulous colour choices you're selecting. I can't wait to see the finished ponchos in all their glory. For my part, I'm feeling a little like I did this time last week. You know, that 'catching up after the holidays' feeling? My Little Miss was off school last week so my plans to get back on top took a little set back while we regressed into holiday style sofa-slouchy-mode. While that was great for the progress of my latest knitty project it hasn't really helped my productivity levels in any other area. Still, there is always this week to tackle the job list and I do have something to show you. I found these little things to be a nice Easter project. Something quick that I could make head way with now and then, even when we were busy. 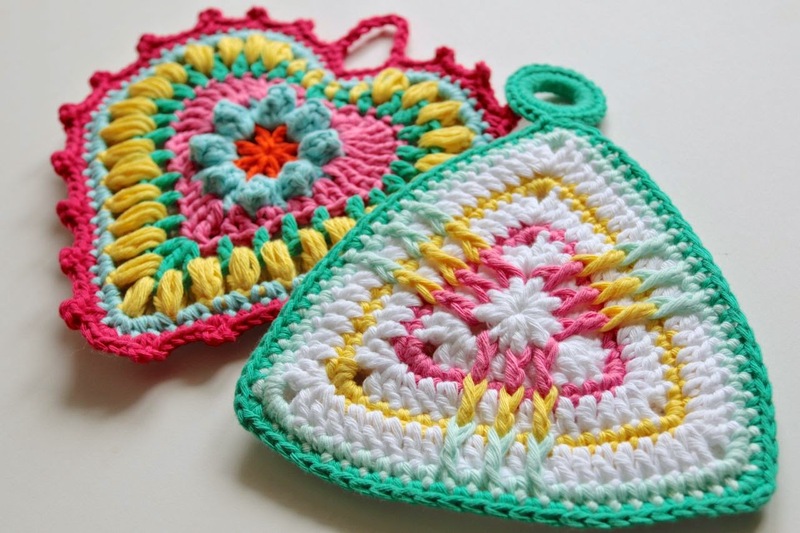 A couple more potholders to add to my fledgling 'wall of modern vintage potholders'. My colour choices are making my 'vintage' collection of potholders rather more modern than the recreation of a collection of old treasures that I'd originally imagined but I can't seem to resist the colourful shades for these designs. So now my first pot holder, the flowery one has some little friends to hang with it and keep it company and has now magically transformed from a potholder strangely hanging on a wall for no reason, into an official collection. Albeit a teeny tiny one. I like how it's looking though and I've found plenty more patterns I want to try, so the collection will definitely be growing soon. 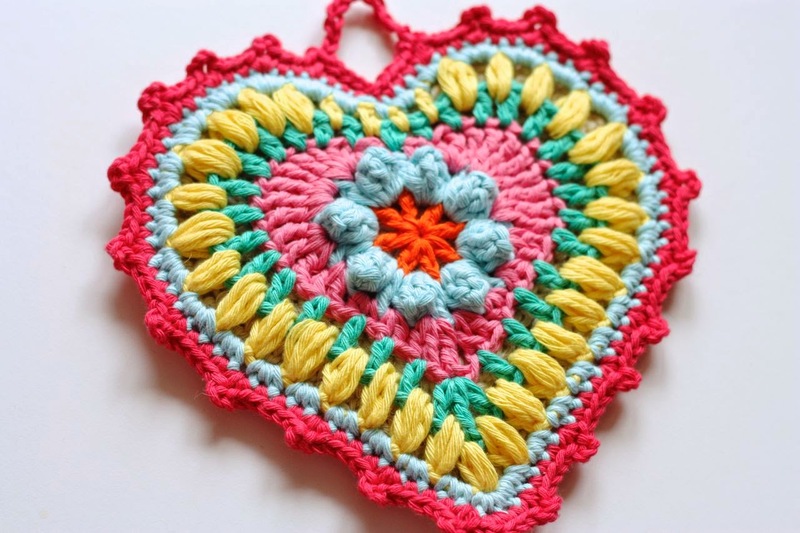 I love your potholders, they are lovely. 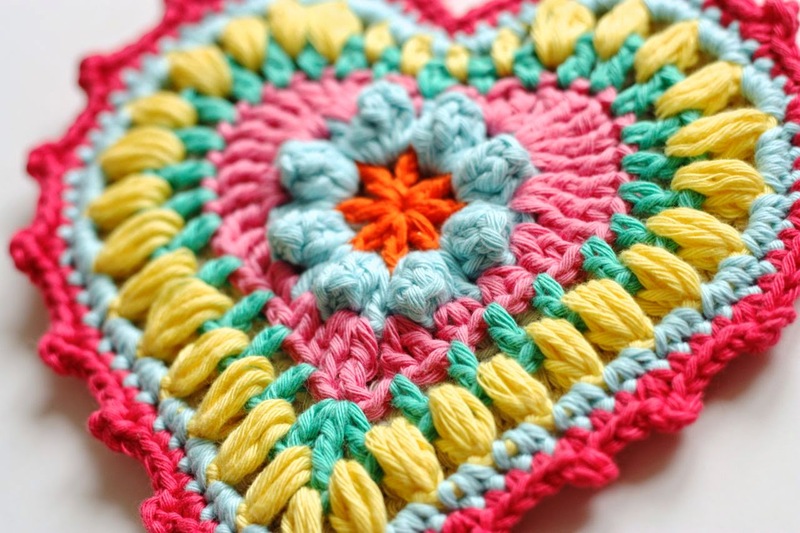 I love your heart potholder! I love them all but the heart is amazing. They're really pretty and I love how they all look grouped together on the wall. Something like that would really brighten up my kitchen. I always love your color choices! So bright and happy! Also, I love the idea of hanging the potholders. I think I am shall copy your idea and hang some in my kitchen! Beautiful work, they look lovely together. I haven't got it together after the Easter holidays either, even though I seem to be rushing about a lot. But hey, there's always tomorrow. I love your potholder collection. I think they look really "retro/vintage". They definitely belong on the wall as they are much too beautiful to use! 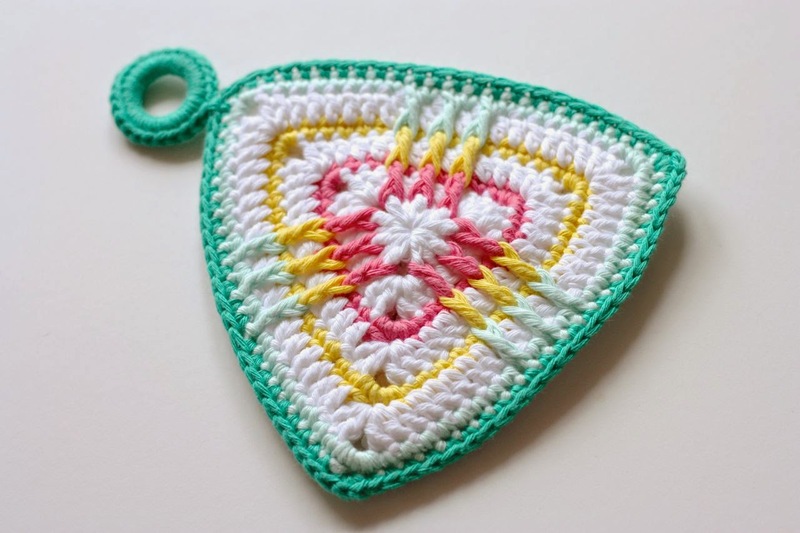 Love seeing your potholder collection grow! Wow !!! It is all I can say. . . 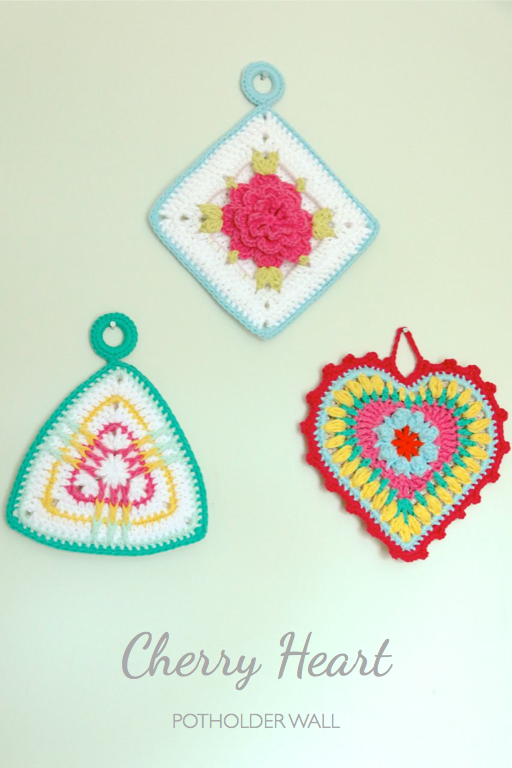 I love them all, but my favourite has to be Grandma's Heart. I had seen it in your IG feed and loved it straight away. I'm on the edgings of the Loopy Loo Poncho !! so excited !! Beautiful Sandra, an abundance of colour and texture. Have a lovely weekend. These are so adorable!! Great colors also! So pretty... 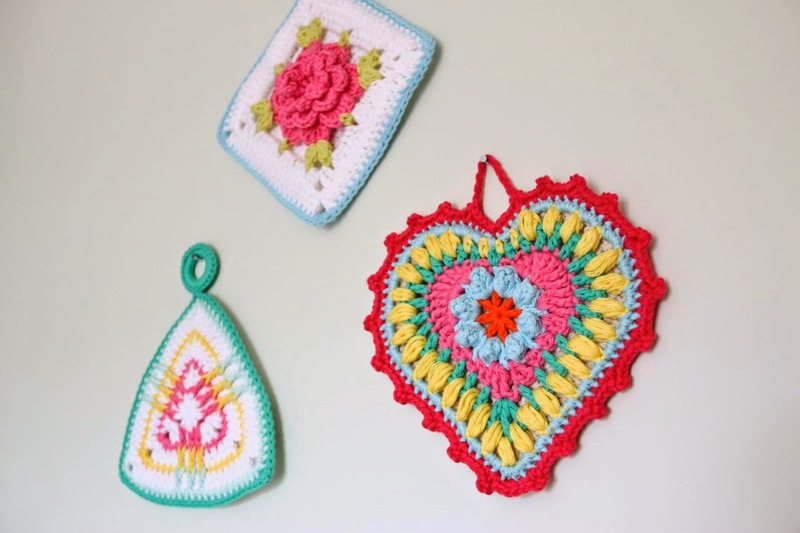 I think everyone needs a potholder wall!